Moving may be a chore, but at least it’s not mandated. Yet. 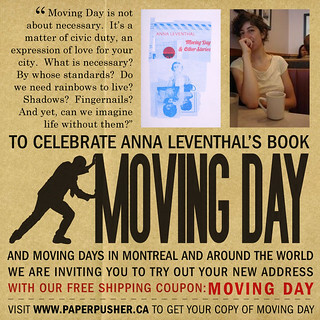 Celebrate your right to choose your address by ordering a copy of Anna Leventhal‘s Moving Day & Other Stories during the month of July, and Paper Pusher will do the heavy lifting when it comes to shipping. That’s right: free shipping in honour of your new (or old) address! Taking Quebec’s Moving Day as inspiration, the wry title story of Anna’s chapbook envisions a city where changing address is law and refusing to pack is a form of civil disobedience. Read more about Anna’s inspiration, then get your own copy of Moving Day. The elegant, black risograph-printed booklet travels light–perfectly portable for whenever your next moving day rolls around.